Bang and Olufsen Create New Portable Speaker Line | OhGizmo! By Ryan Nill on 08/13/07 • Leave a comment! Danish design company, Bang and Olufsen, have unleashed a new line of modular, portable speakers; the Beolab 3. Despite the exceedingly odd shape, the Beolab 3 is being marketed on extreme versatility and portability. They can handle up to 250 watts and include three drivers; a mid-range driver plus two passive radiators that give a much need bass boost to such a small unit. Also new and/or interesting is the tweeter, which sits on top of the speaker from a retractable silver stand; marketed as “Acoustic Lens Technology,” it is supposed to disperse the sound and lead to a more pleasurable listening experience. The Beolab 3 is made from solid aluminum and measures 6.4? x 5.2? x 8.8? and comes in black, gray, red or blue. 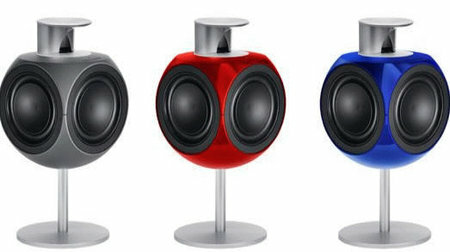 This is about the size of standard PC speakers, unlike standard PC speakers, it doesn’t come cheap: the Beolab 3 speakers retail for about $3,200.